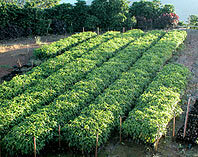 HMA’s Coffee Nursery produces a total 80,000 seedlings per year. The seeds are certified by the “Estación Experimental Agrícola”. Once sprouted, the plants are cared for until they are mature enough to be transplanted. Transplanting (from the nursery) takes place with much care during the May rains that moisten the soil and stimulate further growth. The timing and quantity of the rain is important, and is the subject of much speculation every year by local farmers. Too soon, and the plants in the nursery are unready for the shock of transplanting. Too late, and the plants get a late start and will produce a meager harvest. Too little rain, and the transplants produce shallow roots that stunt growth later. Too much rain, and the young plants can drown in waterlogged soil. Finally in October, the slowly maturing green cherries begin to redden. Only a few of each plant's many cherries ripen at the same time, so it is necessary to pick selectively and return time and again to the same plant. 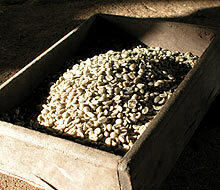 This is a very labor-intensive process and one of the most important parts in producing a high quality coffee. A typical harvest will begin in September and not end until March. 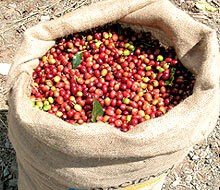 Once the coffee is picked, processing must begin as quickly as possible to prevent any deterioration of the cherries. First the cherries are dumped into flotation tanks to remove any foreign matter or unwanted cherries. Then the coffee cherries are pulped and demucilageinated using state of the art ecologic machinery that consumes a minimum amount of water, thereby markedly reducing the use of the precious liquid. 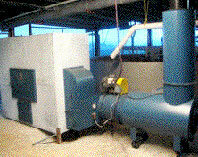 This machinery has the capability to separate between ripe and unripe, large and small cherries. However this capability is barely used since during the coffee picking process we ensure that only the ripest and perfect cherries are selected. This process is closely monitored to ensure the intrinsic qualities of the coffee beans are preserved and to produce a green coffee that is homogeneous and free of defects. The byproducts of the pulping and demuciligeinating process are used as compost (organic fertilizer) for our coffee nurseries. The drying operation is the most important stage of the process, since it affects the final quality of the green coffee. A coffee that has been over dried becomes brittle and produces too many broken beans during hulling (broken beans are considered defective beans). Coffee that has not been dried sufficiently will be too moist and prone to rapid deterioration. Our Specialty Grade coffee is routed to Ecologic Static Dryers featuring horizontal perforated trays for drying and pre-drying. 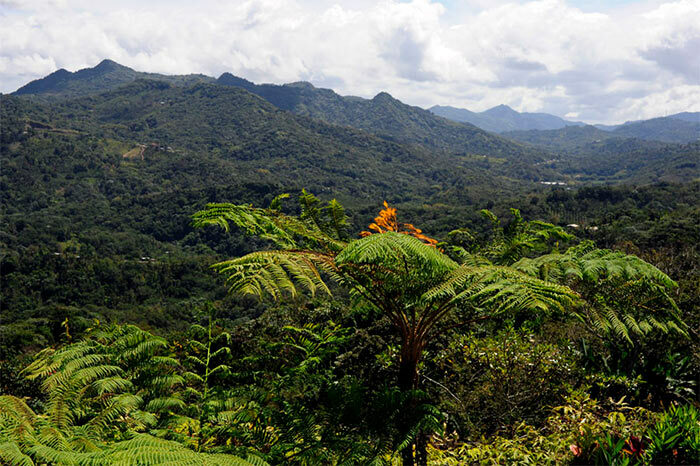 The specialized units are considered “Ecologic” due to their highly efficient methods of drying coffee. Because of a unique double layer configuration, the same heat that dries coffee on the bottom tray is then ducted to the upper tray where more coffee beans are pre-dried and this method saves on fuel energy. Additionally, the beans are dried indirectly, via heat exchangers, at lower temperatures (100 degrees F) preserving the aromatic oils and flavor potential of the green coffee. Our Premium and Superior Coffee Beans are dried on five (5) Fixed Bed Rotary Dryers, with shallow, perforated trays and screen bottoms. Coffee is placed on the tray, and heated air is forced through the coffee via the screen bottom. Each Dryer has rotating arms constantly stirring the coffee beans for balanced drying. 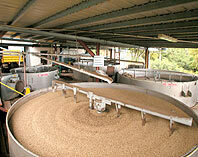 Parchment and bean hulls are forced to the top surface so that workers can skim off the by-product waste. This by-product is later composted and re-cycled for use as a natural, organic fertilizer. After completing the drying process the coffee is packed in bags and stored in humidity controlled storages according to the guidelines of ISO standard 8455:1986. 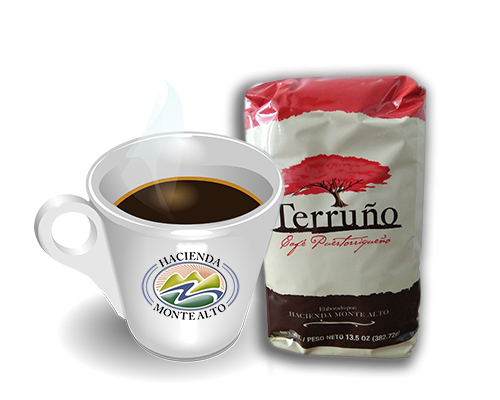 Before shipping, the coffee is hulled to remove the parchment “pergamino”. Then the coffee is sorted and graded in our size separator to the customer requirements. Coffee is called green coffee until it is roasted. The value of green coffee is in its flavor and how it can be used. 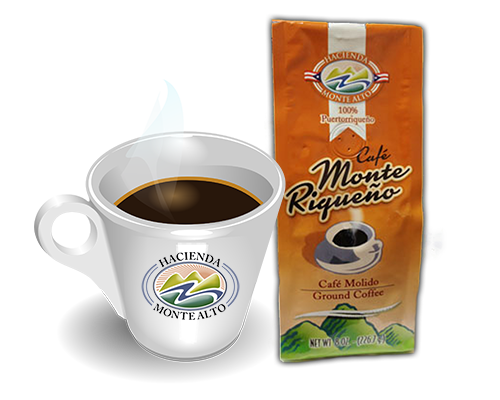 Hacienda Monte Alto cultivates and processes a specialty grade, single – origen, highland green coffee exclusively from the misty mountains of Adjuntas, Puerto Rico. 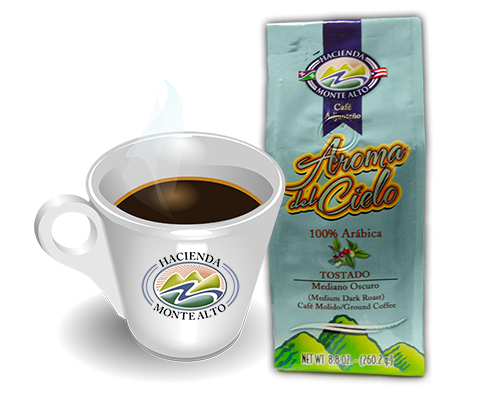 The coffee is 100% Arabica mostly of the Varietals Typica, Borbon, Caturra, Catuai and grown in altitudes of 2,500ft to 3,000ft. We do not warehouse fresh-picked coffee. Hacienda Monte Alto processes and dries the coffee immediately as it comes in to our “Beneficio”. 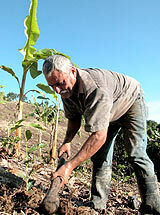 During harvest (September through March) our “Beneficio” operates around the clock. The selection process begins at the farm where workers select only those coffee cherries that are ripe and free of defects. At the “Beneficio”, the selection process continues with our receiving foreman setting aside cherries for HMA's Green Coffee exportation program according to color (ripeness), freshness (temperature) and size. Coffee cherries are then immersed in tanks of pure mountain spring water to check for bean density and to remove any foreign matter. The drying operation is the most important stage of the process, since it affects the final quality of the green coffee. Our coffee is dried slowly, at low temperatures (no more than 100 degrees Fahrenheit) to 10 -12% moisture to preserve the aromatics and flavor potential of the green beans. 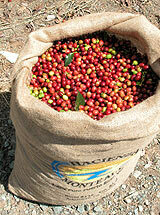 Our Specialty Grade coffee is routed to Ecologic Static Dryers. These specialized units are considered ecologic due to their highly efficient meth ods of drying coffee. A unique double layer configuration, allows the same heat that dries coffee on the bottom tray to be ducted to the upper tray where more coffee beans are pre-dried, saving on fuel energy. After completing the drying process the coffee is packed in bags and stored in humidity controlled storages where the coffee is allowed to rest in parchment. This resting period is very important to impart certain unique characteristics to our coffee. Every shipment of our specialty grade green coffee is hand sorted, selected by size and density. Only AA Green Beans size 17/64 or larger qualify for Export.